I'm big on life's staples — you know, those things that you just can't live without. Some of mine include 1) my jean jacket; 2) Almay eyeliner (it's the best stuff you'll ever find); 3) Diet Dr. Pepper; 4) My Helen of Troy Hot Tools straightener. This is just to name a few. Well, I found another one. I'm also big on staple recipes. One thing I love about writing and posting new recipes is that it keeps me accountable to trying different things, because otherwise I'd stick with about three recipes. The potato soup that my friend Amanda introduced me to is one of those meals that I could make twice a week and no one would complain. So, I took the "formula" for that soup and plugged it in here, simply with a different foundation. Make no mistakes, this is not a healthy soup, but none of the best ones are. 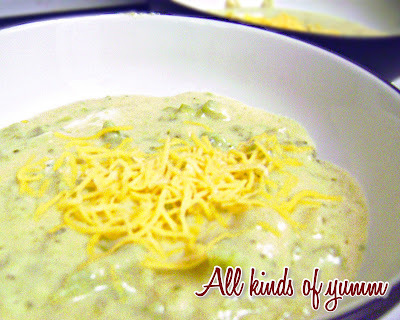 It's thick, creamy and loaded with cheese. And now that I've made it, I'm not looking back. This is not evaporated milk. After you pour the cream of broccoli soup in the pot, fill that same can up with normal milk and you're good to go! I buy a bag of frozen chopped broccoli and microwave it for about a minute. Add both cheeses. Let that warm up until the cheese is melted and blends in with the soup. Add the broccoli and stir. Add the butter. Stir as it melts. Serve hot and topped with cheddar cheese. Place in a bread bowl or served with french or sourdough bread. The only non-negotiables in this recipe are the ratios for the cream of broccoli soup and the milk. For each can of soup you use, you must use a can's worth of milk. Otherwise, you can add as much cheese, broccoli and butter as you'd like. I've just found this to be the best combination for myself. I made this tonight! Super easy...I also diced and sauteed a little onion in the butter and used 8 oz of velveeta with the mozzarella and added a splash of chicken broth. It was delish!